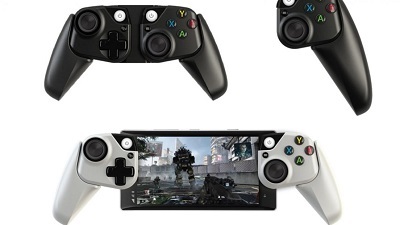 With Microsoft looking to bring "console quality" streaming to phones and tablets with Project xCloud, how will the company achieve that when touch controls are still pretty bad? It seems the company is looking to bring physical controllers to mobile devices to offset this problem, according to these Microsoft Research papers. The research paper documents some of the popular solutions to gaming via a touch screen while hailing the Nintendo Switch and PlayStation Portable (PSP) for circumventing touch-based control limitations with full joysticks and buttons. Microsoft built the prototypes out of foam and then had them 3D printed, based on conceptual renders. The work was carried out quite a while ago, back in 2014, but it seems Microsoft Research has resurfaced their efforts recently, noting the recent success of the Nintendo Switch. While this research may be far away from turning into an actual product, it's pretty imperative that Microsoft takes a serious role in exploring how it can improve the way Xbox games will handle on a mobile device to help take Project xCloud mainstream. Touch-based inputs have always felt like a half-way solution and will feel even more like one when they come up against games designed from the ground-up for responsive, tactile inputs. Learn more by visiting OUR FORUM.